Germany has some of the loveliest Christmas and New Year’s Eve traditions anywhere in the world. But one of my favorites has yet to catch on in this country, perhaps because of its daunting name: Feuerzangenbowle (literally “fire tong punch”). Pronounced “FOY-yer-tsahng-en-bowl-eh,” this drink brings serious Gemütlichkeit to any gathering. First, and most important, be sure your fire extinguisher has been recently recharged and is within easy reach. 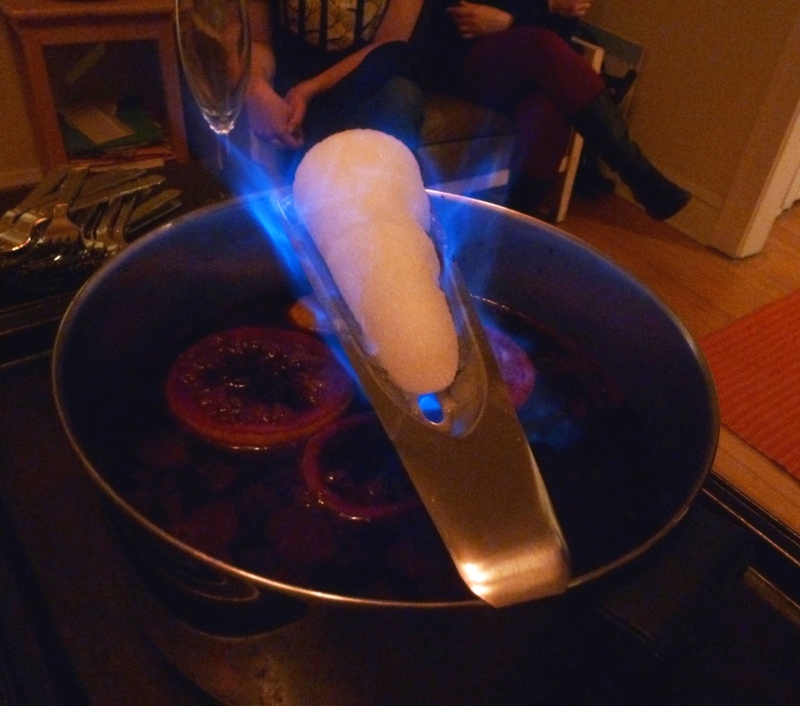 Feuerzangenbowle, like most great party drinks, involves an element of risk. To make this delicious and heady punch, you set a cone of rum-soaked sugar aflame over some mulled wine. It melts into the wine, sweetening and strengthening it. Since you’re adding a fair amount of sugar into the punch, it’s best to use a very dry red wine. 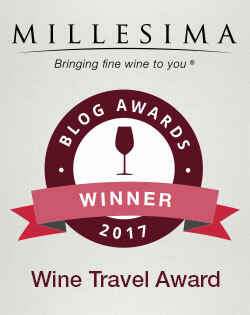 This year I used a 2010 Venta Morales Tempranillo, because that’s what I had lying around, but I usually opt for an inexpensive Bordeaux. It’s also important to use a rum of the appropriate strength. A Rhum Agricole with around 53% alcohol, like Chauffe-Cœur from the island of Martinique, works quite well and flambées relatively easily (purchased for $27 at Andersonville Wine & Spirits, tel. 773-769-0858). Do not — and I can’t stress this enough — do not use Bacardi 151. The first time I attempted to prepare Feuerzangenbowle without the aid of German friends, I made this mistake. The flames almost reached the ceiling, dazzling my guests, horrifying my roommate and singeing my eyebrows. Add in the cinnamon sticks and pour in the wine. Slowly heat the mixture to just below a simmer — do not let it boil. Be sure the orange halves are clove-side down, so that all the cloves are in contact with the wine. You could just toss the cloves in, rather than sticking them in the peels, but then it’s much easier for them to end up in someone’s mug. Once the wine is heated, I like to place four pot holders on the table and set an old cookie sheet on top. With the Feuerzangenbowle pot on the cookie sheet, it’s less likely flaming rum will end up on your table. Set a Feuerzange (sugar tray) onto the pot, and lay the Zuckerhut (sugar cone) in the tray. These two items can be difficult to find. If you live near a German deli or specialty shop, they will likely carry sugar cones this time of year. If not, you can order them online from GermanDeli.com. Even if you can find a sugar cone, you will also need a Feuerzange in which to lay the cone over your pot of wine. These specialized metal trays can be even more difficult to find, unfortunately. GermanDeli.com sells them here, or you can try GermanGrocery.com. Should you fail to obtain a Zuckerhut and a Feuerzange, do not despair. Instead, purchase a box of sugar cubes and a sturdy metal sieve you don’t mind throwing away (be sure the sieve has a tab opposite the handle, so that you can lay it across a pot). Place the sugar cubes in the sieve and lay it across the Feuerzangenbowle pot. Pour some rum over the sugar. If you have a sugar cone, turn it over so that you soak both sides. Gather your party guests, and light the sugar cone on fire. It helps to have a lighter with a long neck, so that your hands are as far from the flames as possible. The flames will last a little while, but it’s necessary to spoon additional rum over the sugar cone from time to time to keep it burning and melting. Again, a spoon with a long handle is best, so that you’re not too close to the flame. Do not attempt, in fear, to toss spoonfuls of rum onto the burning sugar. The flames will only be larger (see right), and rum flung from a spoon has a much greater chance of landing on your table, still aflame. It’s best to carefully move a rum-filled spoon over the sugar, ignite the rum while it’s still in the spoon, and slowly pour it over the sugar. If your sugar cone goes out before it’s fully melted, spoon some more rum over the cone and reignite it with the lighter. Once the sugar has completely melted into the wine, remove the Feuerzange or sieve, give the punch a stir and ladle into small mugs. 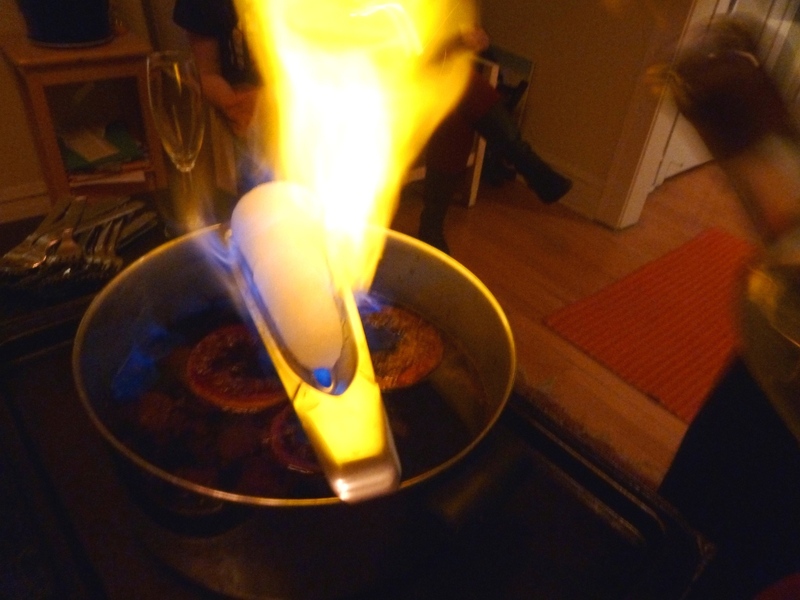 A final warning: Feuerzangenbowle is potent stuff — it’s easy to become quickly intoxicated. Happy New Year, and Prost! FEUERZANGENBOWLE!!!! I love this post and the drink. There are many memories of enjoying a Feuerzangenbowle with friends. It sounds like you’ve perfected it over time. It is always best to enjoy at a party. Happy New Year! Thanks! It is a great drink, isn’t it? One of my all-time favorites, perhaps because it’s always best enjoyed with a group of friends, as you say. Happy New Year to you as well! Interesting! I never thought to save the sugar to serve on the side. I bet it’s pretty tasty, perhaps infused with a bit of rum and caramelization! I’ll have to give that a try next year. Just tasted this drink in Schliersee, Germany christmas market! It packs quite a kick and is delicious! 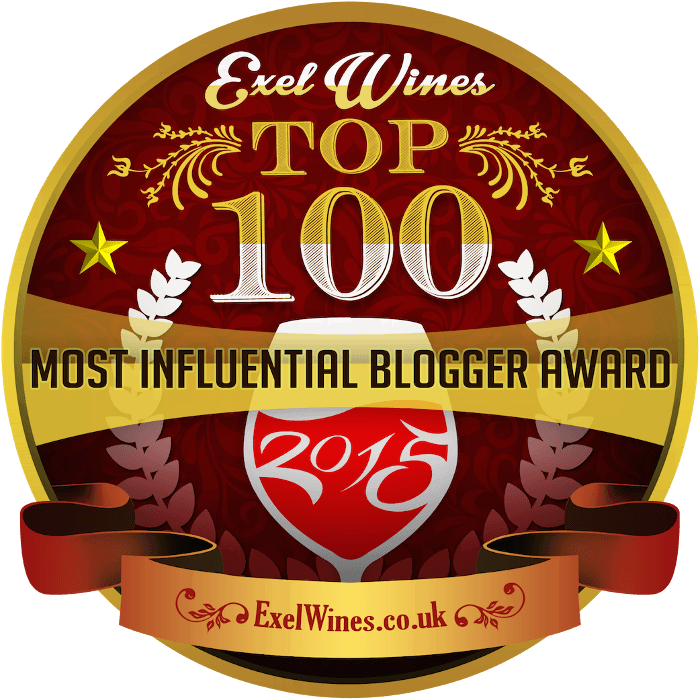 Thanks for the recipe – I will use it at home to celebrate! Hi Pamela – I’m jealous! I bet the Schliersee Christmas market is lovely! I’m glad you enjoyed the drink, and you are most welcome for the recipe. Have fun, and happy holidays! You can easily make your own sugar cone. Buy standard granulated sugar and fill a mug with the sugar. Next, pour the sugar from the mug into a large mixing bowl. Wet your hands. Using only the water remaining on your hands knead the sugar, working the moisture through the sugar in the bowl. You will notice that the sugar will start to stick but it will not dissolve. Pack the sugar back into the mug tightly, turn the mug upside down on a baking tray, and tap the top of the mug. The sugar will fall out onto the tray as a perfect cone. Bake the cone on very low heat for about an hour. Thank you for the tip! Actual German sugar cones can be a pain to find, so it’s great to know that there’s a way to make them ourselves. I’ll have to give this technique a try! Hi Geoff — Thank you for the tip – much appreciated!